March 18, 2017: Among researchers, it is well known that air travelers are exposed to cosmic rays. High-energy particles and photons from deep space penetrate Earth’s atmosphere and go right through the hulls of commercial aircraft. This has prompted the International Commission on Radiological Protection (ICRP) to classify pilots and flight attendants as occupational radiation workers. Many studies of this problem focus on ionizing radiation such as x-rays and gamma-rays. On March 16th we turned the tables and measured neutrons instead. 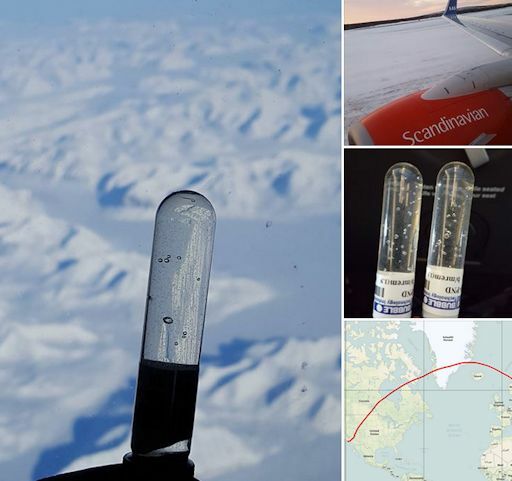 During a 12-hour flight from Stockholm to Los Angeles, Spaceweather.com and the students of Earth to Sky Calculus used bubble chambers to monitor neutron activity inside a Scandinavian Airlines jetliner. In the photo above, taken 35,000 feet above Greenland, each bubble shows where a neutron passed through the chamber and vaporized a superheated droplet. By the time the long flight was over, we measured almost 20 uSv (microsieverts) of radiation from neutrons–similar to the dose from a panoramic X-ray at your dentist’s office. This confirms that neutrons are an important form of aviation radiation relevant to both air travelers and future space tourists. Where do these neutrons come from? Mainly, they are secondary cosmic rays. When primary cosmic rays from deep space hit Earth’s atmosphere, they produce a spray of secondary particles including neutrons, protons, alpha particles, and other species. Cosmic ray neutrons can reach the ground; indeed, researchers routinely use neutron counters on Earth’s surface to monitor cosmic ray activity above the atmosphere. Now we’re doing the same thing onboard airplanes. Earlier in the week, we flew these bubble chambers to the Arctic stratosphere using a space weather balloon. Interestingly, the 12-hour plane flight yielded ~6 times more neutrons than the shorter (2 hour) but far higher (97,000 ft) balloon flight to the stratosphere. What does it mean? We’re still analyzing the data and will have more insights to share in the days ahead. Stay tuned! 1. To understand Earth’s changing radiation environment: Regular monitoring of the stratosphere over California shows that cosmic rays have intensified more than 10% since 2015. Because of a recent decline in the solar cycle, more and more cosmic rays are reaching the inner solar system and penetrating the atmosphere of our planet. Earth’s magnetic field should protect us against these rays, but geomagnetism is weakening. Globally, Earth’s magnetic field has declined in strength by 10% since the 19th century with changes accelerating in recent years, according to measurements by Europe’s SWARM satellites. To understand Earth’s global response to these changes, we must launch balloons and sample radiation from widely-spaced locations. The upcoming network launch will span three continents, more than 14,000 km of linear distance, and 90+ degrees of latitude. 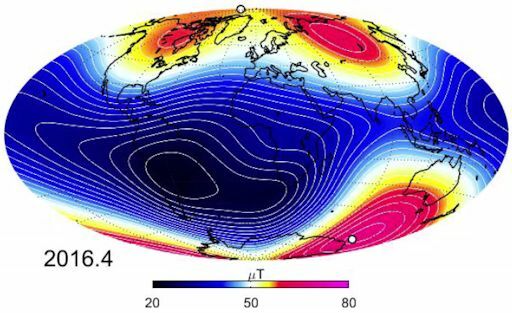 Above: Satellite data show that Earth’s magnetic field is changing: full story. 3. 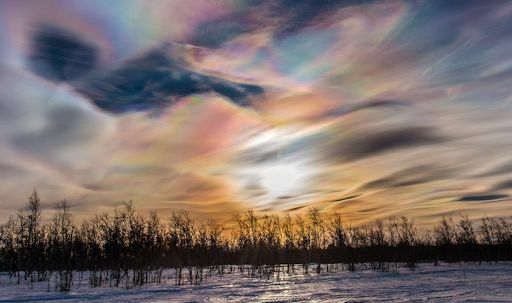 To sample polar stratospheric clouds: During winter months, the stratosphere above the Arctic Circle sometimes fills with icy clouds so colorful, they are likened to the aurora borealis. Polar stratospheric clouds (PSCs) are a sign of extremely cold temperatures in the stratosphere and some types of PSCs are responsible for ozone destruction. Our space weather balloons can fly right through these clouds, sampling their temperature, pressure, and ambient levels of radiation. We can also photograph them from the inside–a possible first! Stay tuned for daily updates beginning March 9th.